potentially nervous: a few days after easter, a confused bells accepts nuage as his personal savior. a few days after easter, a confused bells accepts nuage as his personal savior. Totally hilarious! OMG this is great! Bells was saved by the Nuage. 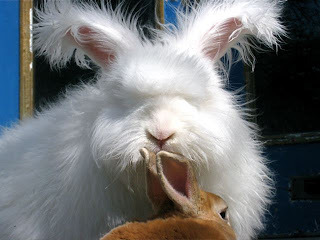 Incidentally, are these real bunnehs, they look, um, ethereal. We all bow before Nuage. Well, and Barrington. Mysterious, all-knowing, all-seeing, all-fluffing. I had no idea Nuage was that much bigger than Bells!